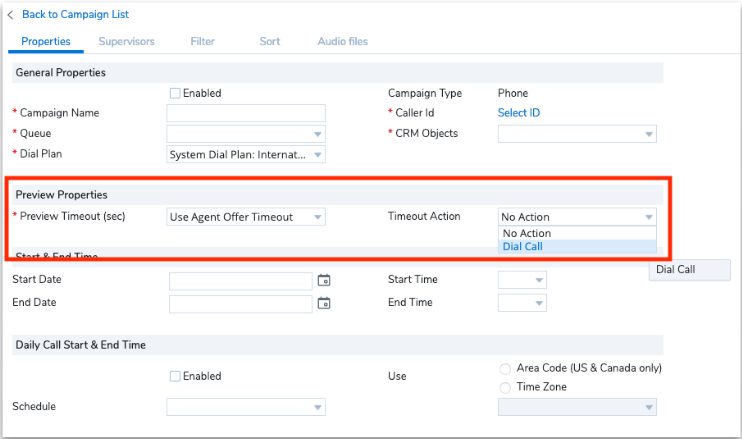 In this release, we have introduced the ability to autodial campaign calls when an agent has spent all the preview time without taking an action. Auto-dialing campaign calls after previewing a campaign record is controlled by a campaign setting. Prior to this release, agents handling a campaign could view the campaign record for the specified preview period and manually start, reject, or skip the interaction. They were not forced to take the interaction in the time allowed. Additionally, the need for a manual action to initiate a call was repetitive and inefficient. With the autodial feature, however, at the end of the preview time if no action is taken, calls are initiated automatically eliminating the need for manual action by the agent. 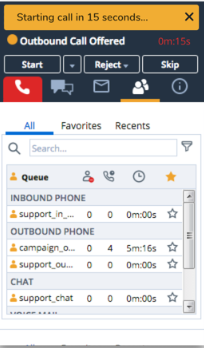 The Virtual Contact Center administrators can enable autodialing for each campaign when an agent’s preview countdown ends. The minimum preview duration is 15 seconds. Navigate to Campaigns from the menu. Select to edit a campaign and scroll down to Preview Properties. For the Preview Timeout (sec), select use Agent Offer Timeout. The default is 15 seconds. For Timeout Action, select the Dial Call option. Dial Call: To place a call to the previewed party automatically once the preview time elapses. No Action: To allow the agent to start, reject, or skip the call. Note: By default, the No action option is selected. Assumption: The agent is a member of the queue to which a campaign is assigned. As an agent, log into Agent Console and change the status to Available. As a member of the queue to which a campaign is assigned, a preview of a campaign record is offered and triggers the preview countdown. A notification appears alerting a call is about to be placed if you do not take an action manually. When the preview countdown times out, the system initiates a call automatically and your workplace phone rings. 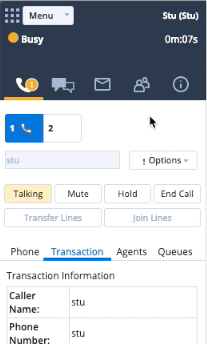 If the agent is connected via Off-hook the customer’s number will be called and they will be connected immediately. The interaction continues as normal.